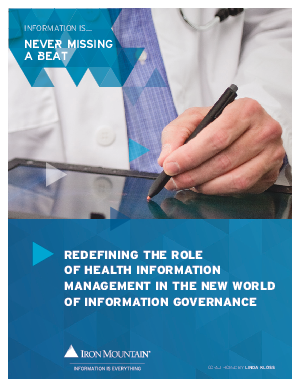 The pervasive adoption of Electronic Health Records (EHRs) and other technologies is enabling healthcare delivery and payment reform and reshaping the work of healthcare professionals — but perhaps nowhere more directly than in the discipline of Health Information Management (HIM). Over a relatively short period of time, the millions of dollars invested in EHR acquisition and integration have produced a domino effect of accelerated change in the HIM environment. Physical medical records are being phased out, more stringent regulatory directives have emerged, and demands have evolved. As a result, the essential tasks being asked of HIM professionals are different. It is often difficult for HIM professionals, deeply immersed in the trenches of this change, to rise above day-to-day demands and envision and develop new opportunities. But that’s exactly what needs to happen. When faced with the ambiguity of change, the surest way to succeed is to fully engage in driving it. Only through this proactive effort will HIM be able to redefine its role and deliver greater value in today’s largely electronic environment. This paper examines a new paradigm for Health Information and Records Management (HIRM) and provides practical guidance to help HIM professionals unwind paper records, offload the burden of low-value production work and lead the transition from traditional records management to an optimized HIRM model. Leveraging these compelling insights, HIM professionals can establish a clear connection between their expertise and the organization’s ability to improve service, reduce costs and advance the management and use of information to support overarching strategic goals.